Our Lady appeared to the three children of Fatima – Lucia dos Santos and her two cousins, Francisco and Jacinta Marto – six times between May 13 and October 13, 1917 at the Cova da Iria, near the small town of Fatima in Portugal. In 1920, a wealthy Portuguese man journeyed to Fatima. He was not a believer, but while at Fatima he underwent conversion. In gratitude for his conversion, he commissioned a statue of Our Lady to be placed in the little shrine at the Cova. The man hired the best-known sculptor in Portugal, Jose Ferreira Thedim, to create the statue. This statue became known as the “Miraculous Statue,” as many miracles occurred at Fatima in subsequent years. The Church carefully investigates apparitions before it accepts them. In 1930, the local bishop of Fatima proclaimed the apparitions worthy of belief, and devotions began. Devotion grew slowly, however. The church in Rome was not fully on board for several more years. 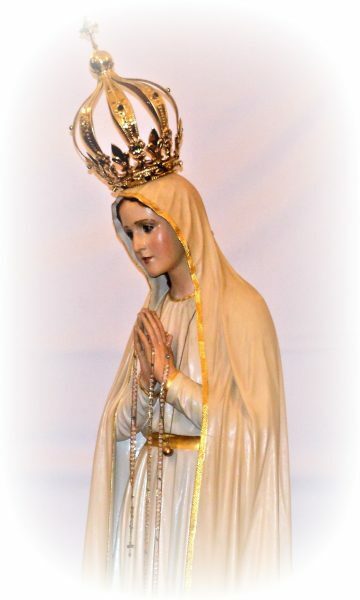 On May 13, 1946, the 29th anniversary of the first apparition, Pope Pius XII sent a delegation to Fatima to crown the original statue and bestow on Mary the title “Queen of the World.” This action by the pope brought international attention to the appearances at Fatima, and triggered the beginnings of widespread devotion to Our Lady of Fatima. Around this time, it was decided to create a new statue of Our Lady, which would be carried throughout Europe and eventually into Russia. Jose Ferreira Thedim was again chosen to create this statue, which would become known as the Pilgrim Virgin, because it would travel from place to place. Thedim began his task by first creating a working model for the Pilgrim Virgin statue. After completing the model, he showed it to Sister Lucia, the only survivor of the three children. Sister Lucia objected that the statue didn’t represent what Mary looked like, so Thedim scrapped that model and created a new one. The second model met with Sister Lucia’s approval, but she had a few minor corrections. The model had a tassel around Mary’s neck; Sister Lucia said it should be a globe. The model also had an eight-point star on her gown; Sister Lucia said it should have five points. Working from this model, Thedim created two Pilgrim Virgin statues, which were made somewhat smaller than his working model (see photo of the sculptor and Pilgrim Virgin statue at left). On May 13, 1947, the 30th anniversary of the first apparition, the first Pilgrim Virgin statue was blessed and sent on its journey through Europe. On October 13, 1947, the 30th anniversary of the final apparition, the second Pilgrim Virgin was blessed and sent to the Americas, first visiting Canada. Meanwhile, in Bowmansvile . 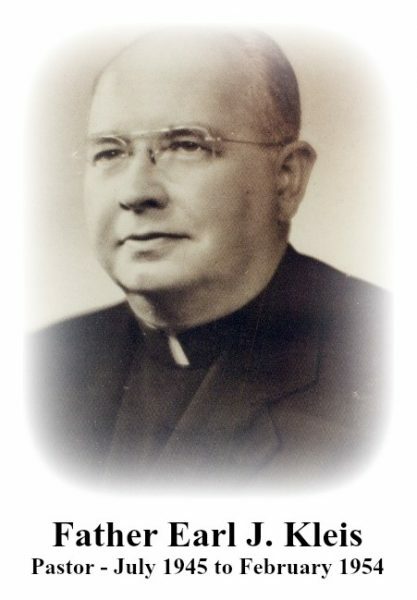 . .
Father Earl J. Kleis served as Sacred Heart’s pastor from July 1945 until his death in February 1954 at the age of 53. 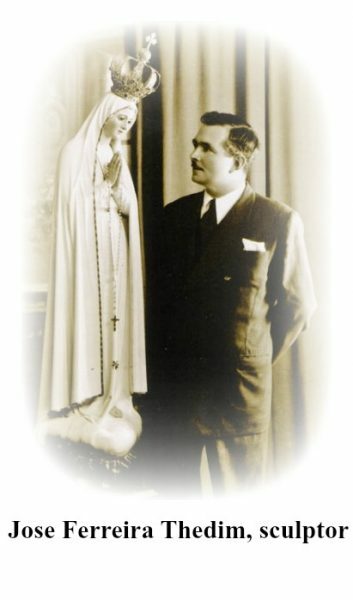 Father Kleis had a very strong devotion to Our Lady of Fatima, even before this devotion became widespread. 13th of each month from May through October (except for August, which was held from the 11th to the 19th). Weather permitting, the Novenas were held in the shrine at 8:30 P.M. These Novenas commemorated the 30th anniversary of the apparitions at Fatima. 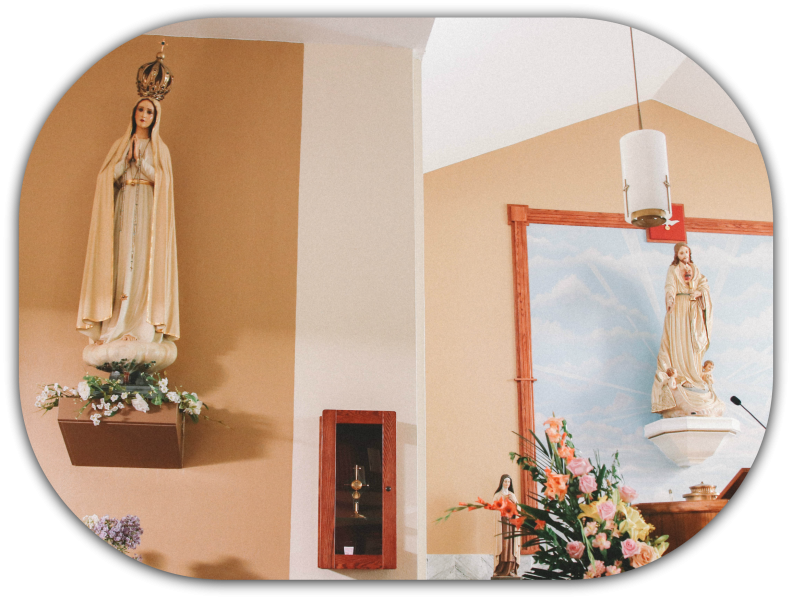 These are believed to be one of the first devotions to Our Lady of Fatima held in the Diocese. Following the series of Novenas, in Fall 1947, Father Kleis traveled to Portugal to visit Fatima. He met the sculptor of the Fatima statues, Jose Thedim, and they had an opportunity to get acquainted. Thedim was so impressed by Father Kleis’s devotion that he offered him the prototype statue from which the Pilgrim Virgin statues were created. Post of the Catholic War Veterans set about the raise the money needed to ship the statue here. Their efforts enabled our parish to bring to reality the opportunity to acquire this outstanding statue. December 1947: The Pilgrim Virgin of the Americas Comes to the U.S.
After touring Canada, the Pilgrim Virgin of the Americas entered the U.S. at Niagara Falls on December 8, 1947. Buffalo was the first stop on its U.S. tour. Buffalo Bishop John O’Hara led the welcoming delegation. The statue was displayed at St. Joseph’s New Cathedral, where thousands of Buffalo-area Catholics came to view it. By this time, Father Kleis had returned from his visit to Portugal with the offer of the prototype statue in hand, and fund raising for the cost of shipping was underway. Before the Pilgrim Virgin statue left Buffalo for its next stop in Rochester, Father Kleis somehow managed to have it make a stop at Sacred Heart on December 10, 1947. A copy of a holy card commemorating that visit is reproduced below. In Bowmansville, fund raising for the shipment of the statue was conducted between November 1947 and May 1948, achieving the necessary $1,200. In Fatima, plans were being made for a huge public pilgrimage to Fatima on May 13, 1948, the 31st anniversary of the first apparition. Father Kleis wrote to Bishop Jose Correia da Silva in Portugal and asked for our statue to be blessed during the great pilgrimage, to which the Bishop agreed. Thedim worked to put finishing touches on the statue so it would be ready in time. Finished by Jose Ferreira Thedim only a few days before the great national pilgrimage of May 13, it [the statue] was taken to Fatima on May 12 and following the solemn pontifical Mass on the 13th on the steps of the Basilica, in the presence of an estimated 500,000 pilgrims, it was blessed by the Bishop of Leiria, Dom Jose Correia da Silva, in the very place where the first apparition took place just 31 years before. Dom Jose, the Bishop, sent me a letter graciously consenting to this favor. 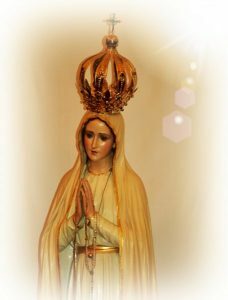 He is a historical character in the affairs of the Sanctuary at Fatima, second only in importance to the three children to whom Our Lady appeared. Following the ceremonies in Fatima, the statue was shipped from Portugal to the U.S. It was lost in transit for a time, causing much concern. But it finally arrived in New York City on July 16, and was then on its way to Bowmansville. Some minor damage occurred in shipping, which was repaired by the Lippich Brothers Studio of Lancaster. The statue is not just another piece of church adornment. It has a special significance and historical value which cannot be duplicated in the Diocese. This is more than just a beautiful work of art. It is a holy and venerated object which brings distinction to the parish, and which brings to the whole Diocese something of the spirit of Fatima which prompts 500,000 people to gather at the Cova da Iria on such occasions as May 13. We do not ask physical or material miracles from Our Lady of the Rosary, but we do pray and hope that all those who come to look upon the benign countenance of her image, may be moved by graces obtained by her to be sorry for their sins, lead better and more fervent Catholic lives, and enter with zeal and enthusiasm upon the work which Our Lady so earnestly and repeatedly requested at Fatima, 31 years ago. The statue of Our Lady of Fatima resides to the left of the altar at Sacred Heart of Jesus Shrine. At the shrine there is a holy relic to the right of the Fatima Statue. 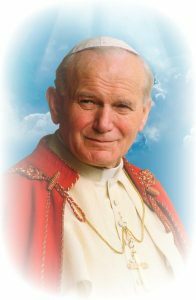 It is the blood of St. John Paul II. Pope John Paul II was shot in a failed assassination attempt on the Feast of Our Lady of Fatima, May 13, 1981, the 77th anniversary of the first apparition at Fatima. Pope John Paul credited Our Lady of Fatima with deflecting the bullet which just missed his heart. The future saint later placed the same bullet in the crown of the Miraculous Statue in Fatima, the first statue of Our Lady of Fatima created by Jose Ferreira Thedim. The statue over the right side altar represents the Eucharist Heart of Jesus. The statue was created by the same sculptor as the Fatima statue, Jose Ferreira Thedim. It was originally created for a religious congregation in Pennsylvania. However, when the statue arrived from Portugal, the buyer didn’t like it, and they refused to accept it. 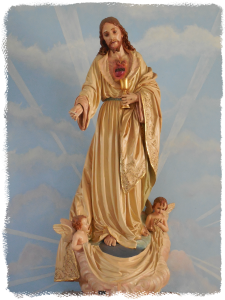 Faced with either shipping the statue back to Portugal or paying an import duty on a statue not destined for religious use, Thedim contacted Father Kleis to see if Sacred Heart would be interested in buying it. Father Kleis was more than happy to acquire such a fine statue of the parish’s namesake. The record is not clear as to exactly when this occurred, but it was likely around 1950-52. This statue resides above the altar at the shrine.